Sometimes it's hard to see the difference between a Genuine and non-genuine Cummins Generator Spare Parts. Non-genuine Cummins Genset Parts may be compatible with Cummins engines, but are not manufactured or reproduced using the same procedure or material as the exact specifications of Cummins. CV. 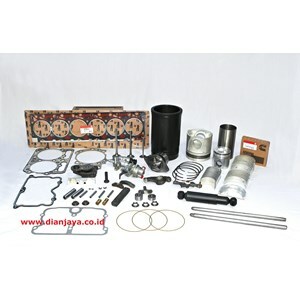 Dian Jaya Sell Cummins Genset Parts that are guaranteed authenticity to ensure the longevity of your generator. Of course, it doesn't matter how good the quality of Genuine Cummins is if a part isn't close when you need it. That is why we sell Cummins Genset Spare Parts to store them in local inventory. If for some reason the part you need is not yet available, we can quickly get it through our global logistics network. Regardless of where you are, we can find the original Cummins section that you need right away and immediately speed it up to you, minimizing downtime and losses related to productivity. Sell ​​Cummins Genset Parts with better performance and reliability until on-time delivery of parts to unmatched warranty and service support. All selling prices of our Cummins Genset Spare Parts are standard selling prices, in accordance with the specifications of generator spare parts / generator spare parts that we offer. To meet the existing market demand, besides selling Cummins Genset Spare Parts, we also help all our customers to indent certain generator spare parts orders. Each indent of a generator spare part order has a different delivery schedule according to the ready stock of the country of origin of the goods. To improve the performance of diesel engines one of them by using turbocharger. As one component of gasoline / diesel generator set which spare parts of Surabaya genset provide, in fact the working principle is quite simple, ie convert heat energy and exhaust gas pressure of combustion combustion engine into mechanical energy of spindle shaft for further use compress air entering into combustion chamber through intake manifold. the heat of the fluid passing through it becomes the mechanical energy of the turbine spindle. into kinetic energy of air flow. 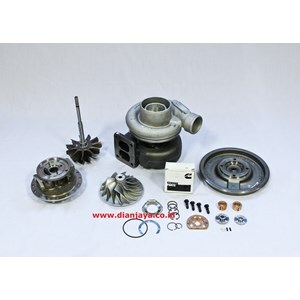 The compressor on the turbocharger is composed of the rotor part and the casing housing. air atmosphere as a media cooler. but go straight to the exhaust. turbocharger compressor is too big.